"We're not happy with what the EU is doing. 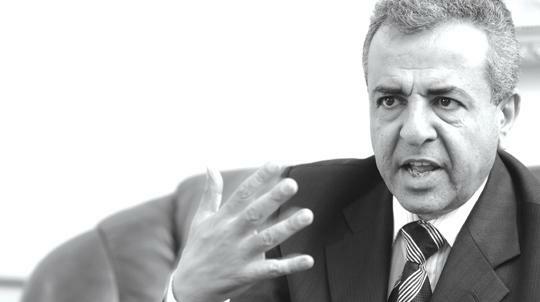 There were many meetings, especially in Malta, Italy and Libya where we always asked for technical help..." - Libya's Ambassador to Malta Saad El Shlmani. Tripoli reacted with anger to the recent appointment of right-wing politician Roberto Calderoli to the new Italian Cabinet, saying it would stop cooperating on immigration. Libya's Ambassador to Malta Saad El Shlmani is more soothing in his words. He speaks to Mark Micallef on oil issues, immigration and Libya's problem with patrols. Foreign Affairs Minister Tonio Borg said in Parliament last week that he was expecting an imminent "breakthrough" in the discussions with Libya over the disputed demarcation line of the continental shelf. Does this mean we could see a joint exploration deal soon? The issue was raised in April during a meeting between Minister Tonio Borg, our foreign affairs minister and our deputy prime minister. From past experience, we either go to the international court like we did in 1984 or we explore the possibility of a joint exploration. I think we will start with a discussion on how we can work together, by having technical people and professionals, who really know the situation from the point of international law or with regard to the geography, meet here or in Libya. In a nutshell, the idea to go for arbitration will be put on hold until the joint exploration option is explored at a technical level? Yes, that's right. If God forbid there is no agreement, one of the sides can then decide that it wants to go to the international court. But I think that given the good relationship between the two countries there is a basis for agreement on joint exploration. So when you say there is going to be this meeting, do you expect to conclude this part of the discussion? Some weeks ago a charity chaired by Gaddafi's son, Seif Al-Islam, said that ties between Italy and Libya could suffer "catastrophic repercussions" if the Northern League MP Roberto Calderoli is made minister in the new Berlusconi government. Why such a reaction from Libya... the cartoon incident happened two years ago; is Libya still so sore? The comments of this Italian minister created problems in Libya, especially in Benghazi in 2006. We feel he did something which reflected badly on us. Incidentally, it also brought to light how sensitive we are to what is said about one another. You know, sometimes we seem to think that if something is said in Italy it will not affect anyone, but then it explodes in Saudi Arabia, Morocco, Libya... so politicians have to be sensitive to religious or ethnic issues. Sometimes, you say something that reflects badly on other people and everyone has a right to say if they are happy with this or they're not happy with it. But the difference here is that Libya seems to be putting very fruitful diplomatic ties on the line because an Italian politician wore a T-Shirt with the Mohammad cartoon in 2006. Is is that serious? Well, after the apology by this particular minister I think this issue is now over. He got the message and he understood. Yes, but he had apologised in 2006 too. This time (some days ago), he was clearer in saying that he did not think that it would offend people in this way. After this apology we consider the issue to be over. Yes, but the visit of Berlusconi was announced in the context of the Calderoli incident. Journalists had been asking about a scathing statement issued by the Libyan interior minister. It seems like Italy still doesn't get the message that this is a closed issue. As I said, our relationship is very good and there is a strong interest from both sides. So you're saying Berlusconi's visit is not tied to this incident? One of the central issues, which involves Malta, is certainly immigration. Now that you're saying the Calderoli issue is a closed chapter, I would assume that even the statement that Libya will no longer cooperate with Italy on immigration as a result of the appointment will be retracted. The interior minister issued a statement a few hours before Calderoli was appointed minister, saying that cooperation with Italy will cease on immigration. The link was not explicit, but it was obvious because of the timing. Will this change? We never stopped cooperation with anyone, especially with our neighbours. Libya is always cooperative on all issues, especially on immigration. We're the main victim of immigration. If hundreds come to Europe, it's because Libya would have stopped thousands, and if thousands are making it to Italy, it's because we would have stopped hundreds of thousands. We stop them, we keep them in Libya for while, then we send them back to their countries and pay a lot of money for their transportation. We even give them some money just to go back and we generally invest a lot of money in African countries - Mali, Niger, Chad, and Sudan - to try and solve the problem at the root. So we'll never say we don't want to cooperate. Yes, but this is what the statement says. The one by the Libyan interior minister, which says 'Libya will no longer cooperation with Italy on illegal immigration'. No, that's not the Libyan official position. Never. Libya is discussing and is even doing the job without discussing with others. We deal with it because it is in our interest to do so, but at the same time we are serving our neighbours like Malta, Italy and Europe in general. Sounds like you feel abandoned by Europe. Technical help with patrolling, training, equipment for patrol-ling and to control immigration from the Saharan side. We have 4,000 kilometres of border with Chad, Niger and Sudan. The EU is offering a lot of help for patrolling the Mediterranean. Are you saying that there isn't the same enthusiasm for patrolling the Sahara? Yes, what we have been saying is that migrants are coming from the Sahara, so instead of trying to stop them in the Mediterranean, where most will just die, it's better to do more by trying to stop them on the Saharan side. Then, the long-term solution, obviously, is to do something in the African countries they come from. Did the EU make any substantial offer with regard to patrolling the Sahara? No, they sent delegations, who visit and then go back. I don't think that, as far as I know, there has been anything tangible. So you're saying that this is the major issue in the discussions between Libya and the EU? Yes, we feel just patrolling the Mediterranean is not a good solution. In fact, we believe it will create more problems because there are issues of sovereignty with the maritime borders. But by helping the other side at source, especially Libya, but also places such as Algeria, Tunisia and Egypt, because some immigrants come from there too, we can be more effective. Recently Gaddafi also dealt with this issue of patrolling, but he used quite different terms. He accused Europe of "waging a war against Africa in the Mediterranean" and alleged that migrant boats are capsised during EU patrols. Is this Libya's position? Do you have evidence to sustain these serious allegations? What he was saying is that when immigrants are in the middle of the Mediterranean, often on a small wooden boat carrying some 20 poor Africans, which include women and children, and they see military vessels coming their way to push them back, they can panic and accidents can happen. But the patrols never push back immigrants? They will be frightened anyway, because the boats are what they are and the people on board are very weak and inexperienced, so the chance of an accident is higher. Plus, when they take them on board, what are they doing with them? They are not taking them back. They end up taking them to Italy or Malta or the nearest port of call, which is why we feel this is not the solution. There's a fundamental issue with increasing cooperation on the patrol of the Sahara and that is Libya's human rights record, particularly that concerning immigration. Well, as we always say, this is a very sensitive issue because it involves human beings. You have the facts: people are arriving in Libya and other countries. You can try to stop them, but some will still make it through and then you have to face the issue so you need to strike a balance between giving these people a job, something to eat and the opportunity to live in a dignified way during their stay in your country. Then there is the pressure coming from our neighbours who do not want immigrants, the international law and internal pressures too. So it's a very complex issue. Libya is not a signatory of the Geneva Convention and you are accused of deporting people who will face persecution or who come from war torn countries. We send them back when they are coming from safe countries such as Ghana, Burkina Faso... if they come from countries such as Eritrea, Somalia or Darfur you cannot take them back. But your country is accused of doing just that. If Europe helps with patrolling the Sahara, will it become a border through which politically-persecuted individuals will just be sent back to their death? What we mean by border patrol is that when these people arrive they will be looked after in the desert, because just as people die in the Mediterranean, they are dying in the Sahara - it's a sea of sand. When they arrive, you take them in, you establish where they came from and then you try to find a solution. Of course, it's not easy we're talking of the Sahara here. It's a very difficult situation, even for our patrolling forces, but with the cooperation between Libya, African states and European countries that are interested I believe we can find a solution. Would Libya accept help in the form of military personnel? I think there are always ways. Even accepting some help with human resources can be acceptable. It can be done in a way that will not be an invasion into our sovereignty. Through discussions and meetings, where the parties are in good faith, I believe we can find solutions to this phenomenon, which will be with us for many, many years. If one of the sides feels it is simply being pushed into a corner the reaction will not be a positive one.